Oxford University Press, USA, 9780195177602, 320pp. Scholarship in the history of modern philosophy has changed dramatically in the last hundred years. Early in the twentieth century, philosophers such as Bertrand Russell and others regularly wrote on historical topics and figures, albeit from the perspective of their own contemporary concerns. But gradually, interest in the historical Descartes, Kant, and other figures fell off as more analytical approaches came to dominate. This lasted until the late 1960's, which saw a profound renaissance in historical scholarship. Philosophers rediscovered the vitality of seventeenth- and eighteenth-century philosophy, using both analytical approaches--which look at historical problems through a contemporary conceptual lens--and historical approaches, which reconstruct the views of philosophers from within their conceptual framework. There is now a vital, international community engaged in this scholarship. 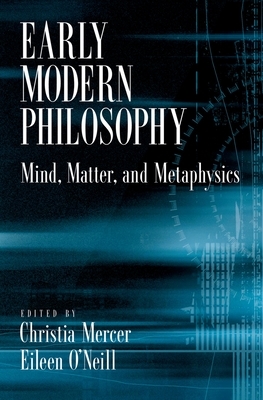 This volume showcases the best work now being written on a wide range of issues in early modern philosophy--a period in which numerous philosophical problems that continue to engage us today were first identified by Locke, Berkeley, Kant, Spinoza, Leibniz, and Descartes. Collectively the articles exemplify the diversity of methodological perspectives currently being employed by some of the most distinguished, internationally recognized experts in the field. Christia Mercer is Gustave M. Berne Professor of Philosophy at Columbia University. Eileen O'Neill is Professor of Philosophy at University of Massachusetts, Amherst.